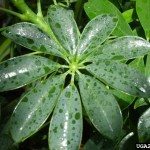 My schefflera plant keeps getting black leaves and then they fall off. What is wrong and what do I do about it? Thank you for your help.